Blog | Bartok design Co. Blog – Page 24 – Bartok design Co.
Until now most of our production was directed to end users, anyway recently more Bartok ofuros are installed in commercial projects. 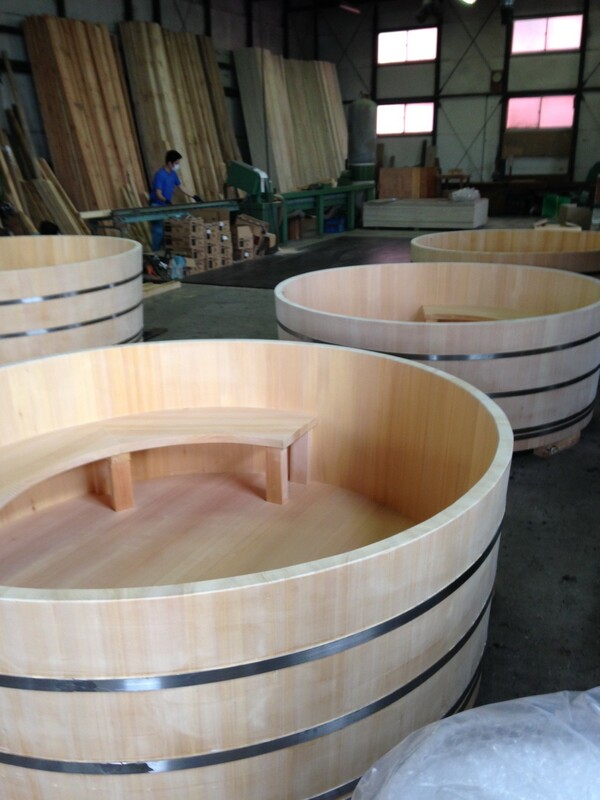 This time a restaurant in Honk Kong will employ 8 large round tubs (each seats 6 people). We dealt with the architecture office in charge of the design and the order process was smooth and carried out with professionalism. We completed the first lot of 4 which will be shipped in a container. The second lot is due to be delivered in august. * details: SUS metal straps. Internal bench. Iron brand at center top. Next time I go to Hong Kong I will definitely want the experience! Do you know of any electric re-heat systems for your soaking tubs? Thank you for your interest in our japanese bathtubs. You should use equipment available in your area. I would recommend to contact a SPA equipment dealer/installer near you. An ofuro can be treated as a regular spa/hot tub. The equipment sizing will depend on the capacity of the tub. I found this compact heater without tank (post-heating). Of course it should be coupled with a small pump for recirculation and with a cartridge filter if you wish. Since ofuros are made of solid wood, you can open holes for inlet/outlet almost everywhere. Please let me know of any other question/problem. I just had a meeting with the water filtration/circulation technician. 1. 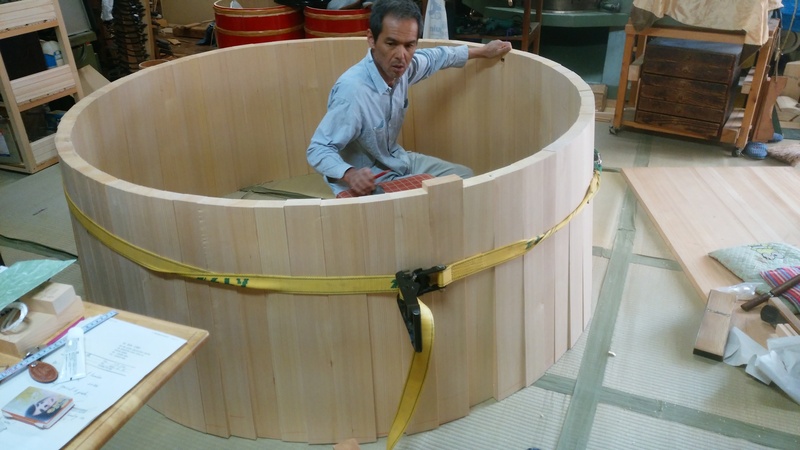 Do you recommend to install hydrotherapy jets with 6-persons hinoki tub? 2. How do you suggest we deal with the overflow? 1)As you know, japanese onsen are usually not equipped with jets. Often there are some shallow “bed type” jacuzzi tubs for individual use. Some people may feel that japanese bathing has a precise ritual and aesthetics and does need the bubbles. Others may appreciate the jets as an upgraded and more luxurious japanese tub. This choice depends on your clientele and on the services that you offer in your establishment. If you decide to use jets, there is no incompatibility with wooden tubs. Anyway we would recommend you to ship us the nozzles so we can seamlessly embed them in the locations as per your instructions. Many small air outlets on the bottom of the tub (air-blower) are not recommended as they weaken the structure of the tub. 2) Overflow: of course the whole floor will be waterproof and with a floor drain. c) to insert the tub into a recessed floor area equipped with the drain. The water can be recessed just 10cm to cover the bottom apron or can be recessed up to the top border, it depends on your layout. We are an architectural firm in New York City and currently working on a project for a client in Connecticut. The client likes your hinoki tubs. Are these tubs only available as soaking tubs, or is it possible to build them with air or water jets? 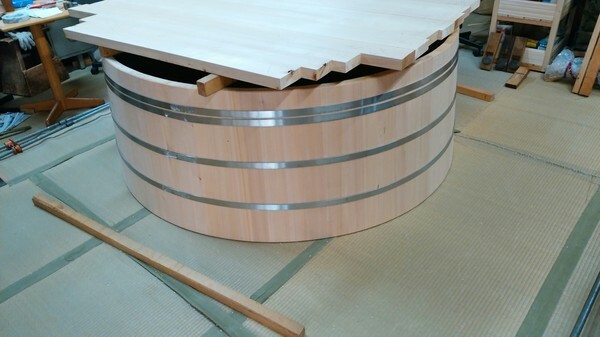 The tubs are made in japan using the traditional Edo carpentry technique. They can be converted to jacuzzis but we cannot supply this equipment from here. In this way there is no problem for maintenance/replacement parts. Please try to contact a local pool/spa equipment supplier and ask for their advice. Basically our tubs are made in solid wood and is very easy to open holes anywhere is needed to apply the jets. 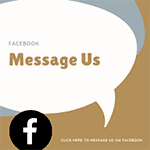 We are looking forward to working with you and remain at your disposal for any question. Thank you for your interest in our japanese bathtubs! freight so the timeframe is very tight. quotation and drawing for your reference. to provide assistance, spare parts etc. We are now working on an order of 8 tubs for an Hong Kong restaurant. The first lot of 4 will be shipped in july and the second lot in august. I wonder if the customers will enjoy the hot water while eating? Or will take a bath while enjoying the landscape after the meal? I will keep you posted. I am sure it will be a highly successful formula as the “japanese style” is really rocking in Hong Kong as well as Singapore. leaving water in the tub? I am an architect in NYC. I have a project on Long Island for which your tub could be a great feature. I have one concern that I wonder if you could please address so I can decide if we should move ahead and get into the details. I have heard that traditionally these types of tubs are meant to be left with water in them. This would make sense for a wood vessel made of separate pieces of wood (such as a wooden boat). I did not see any reference to leaving water in your tubs. I would like to know from you: what is the tradition and recommended maintenance routine for your tubs? There are some precautions to be taken when installing a wooden bathub. The main point is to maintain a balanced relative humidity between 40 and 60%, which is by the way also an optimal environment for pianos, antique furniture, and of course human beings! – use the tub at least 3 times a week. This routine restores the optimal wood humidity. – leave some water inside the tub and cover it. This should be done in case the tub is left unused for one week or more. Anyway you should still not use heating or AC as the humidity of the wood of the external side of the tub will differ from the humidity inside and may cause the wood to warp. Since leaving water inside the tub may cause stains and originate a water-line, we recommend to leave a bassinet with water inside and place it inside the tub. If the tub is covered, the humidity will be trapped inside and will be enough to keep the wood hydrated. matter) to the centre but along the side of the tub? 1) We cannot install pop-up drain fittings. Basically, there are no standard fittings for a thick bottom plank such as a wooden bath. Even if we were to modify a socket and adapt it, we could not be responsible for mechanical problems, spare parts etc. so we prefer to stick to a rubber plug type. If you prefer, we also have a spherical shape available. 2) Yes, we can place the drain on one side, please note that we recommend an offset of 55mm from the internal wall face. On the other hand, if you are planning to attach the drain to the plumbing using an elbow, the “feet” under the tub will interfere with it. If you let us know the direction in which the elbow will be pointing, we will calculate the offset and place the drain accordingly. Last month a client was enthusiastic at the idea of purchasing a japanese bathtub. Unfortunately, the shipping cost quotation came as a cold shower. She asked if there was a way to lower the cost. Actually, we charge only about 5,000-9,000 JPY for processing fees, the rest is pure cost, as we receive it from the shipping company. After years of comparative bidding, we selected the best providers. Some are very specialized for some areas (eg. Australia), some are more competitive for air, some others for ocean shipping and so on. We usually request a couple of quotations and submit the cheapest. Anyway, let`s go back to the conversation with the client I mentioned here above. Well, we were talking on the phone and I was almost dazzled at the light bulb she had! A friend of hers from California was also planning to buy an ofuro! This could be a great chance! But after hanging up, I had my own light-bulb: how about opening up our schedule to the clients so that they can find another japanese lover with a matching schedule? This is why I am now writing this page. I will test a new method (beta version) using a third party scheduling service. If it works I will find a long term solution. Please access the calendar here. 1) Choose the service according to your area. 2) Choose the preferred date on the calendar. If we find another person with similar schedule we will contact both to verify if there is flexibility and try to ship the 2,3 or more ofuro all at once! This could make you save big bucks! Please let me know any comment or advice here below. 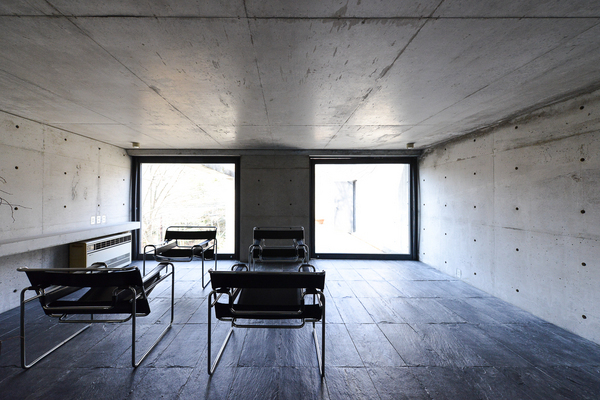 Ando Tadao house … for sale! Well, this may seem a little out of topic compared to the other posts of this blog. 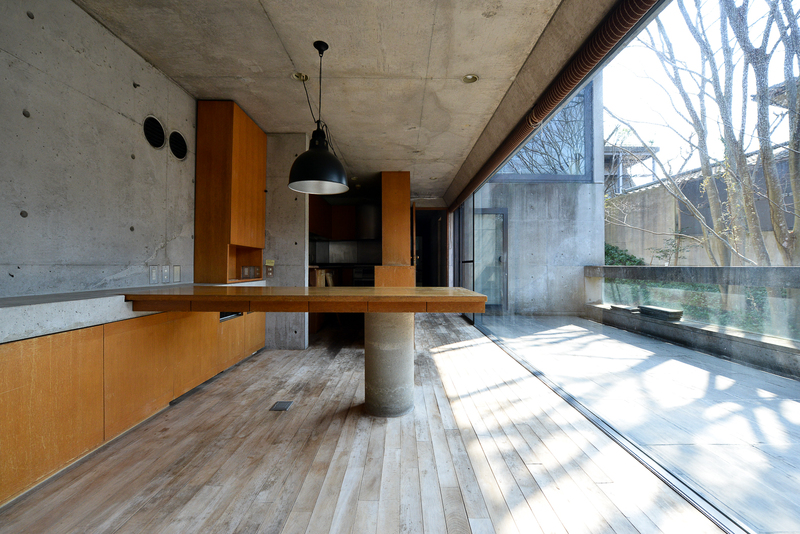 Well, I heard of a 1984 house designed by Ando Tadao which is for sale and I`d like to share with you this juicy information. I am noticing that many residents of Singapore and Honk Kong are eagerly purchasing real estate in Japan: I would be honored if this post helped you finding the house of your dreams! My friend Rica is married with an Englishman and lives in Kobe. It is located in the green Megamiyama (Nishinomiya city) with easy access to both Osaka and Kobe. The good news is that we can provide one for you, to match perfectly the size and style of the house ^^!